I LOVE raspberries! Don’t you? I was looking for the perfect Summer dessert besides ice cream and I have found it! Really, this Rapsberry Cheesecake is SOOOOOOOOOOOOOO delicious! No, I’m NOT exagerating! AT. ALL. If there was one recipe you would try from my blog, try this! Please! You won’t regret, I promise. I think I could easily eat the whole cheesecake by myself! The first time I ate this DELICIOUS cheesecake was at my boyfriend’s house. His mom made this. Oh it was so, SO good! I then decided to make one myself! One year later, it happened! I must say, if I had known that my cheesecake would turn out to be so good, I wouldn’t have waited a year to make it! Even the neighbours loved it! 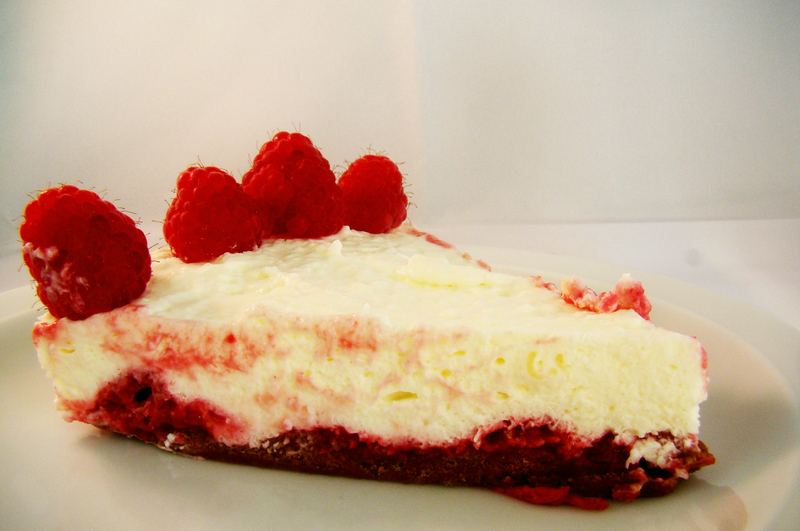 Now, let me introduce you to the amazing Raspberry Cheesecake! Thank you Angie at The Novice Gardener for this awesome party and of course also a big thank you for the co-hosts! I put a sheet of baking paper (cut out in a circle) on the bottom of the spring cake tin. Melt the butter. Crunch the Biscoff. Blend these two with your hands. 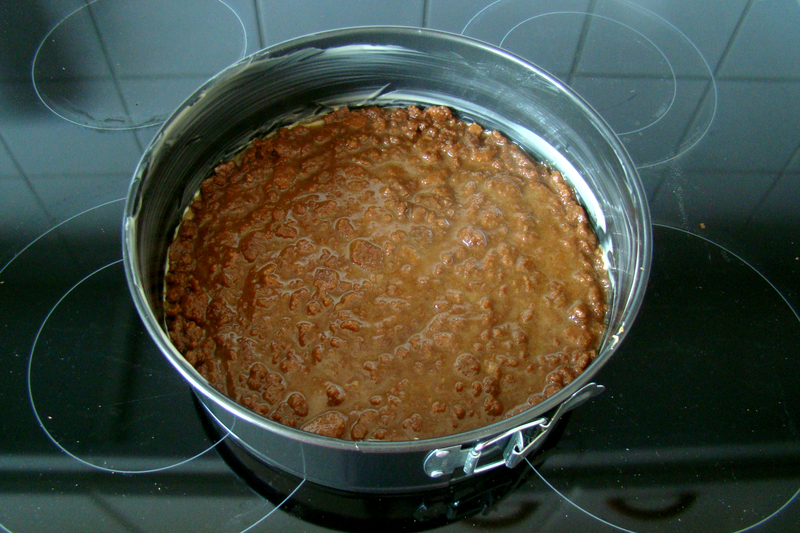 Fill the bottom of the spring cake tin with this mixture. Make sure it is spread equaly. 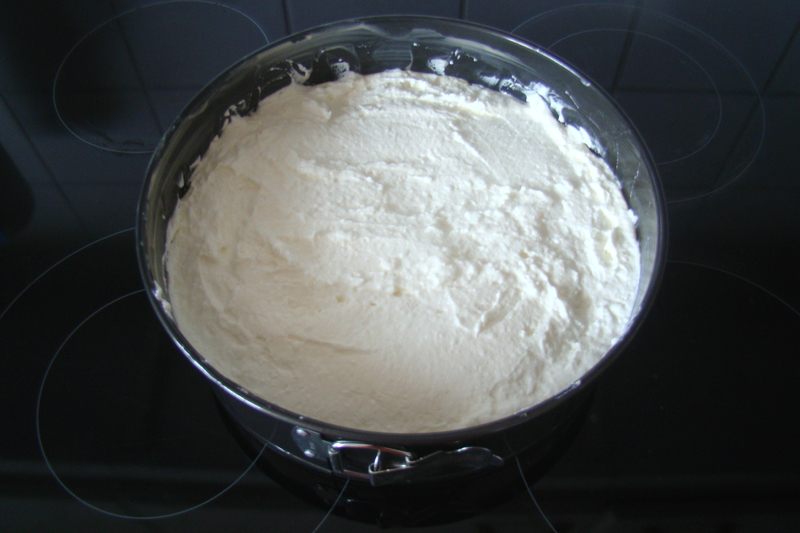 Mix the cream cheese together with the sugar and the vanilla sugar until it is nice and smooth. Soak the sheets of gelatine in cold water. Squeeze the lemon and heat the juice a little. Squeeze the sheets of gelatine and add them to the lemon juice. Stir until the gelatine is completely absorbed. (This may take a while. If it is not hot enough, put it in the microwave for about 30 seconds. )Add it to the miture of cream cheese and blend well. Whip the cream and blend it with the cream cheese mixture. Put some raspberries on the cookie crust. Put the cheesebatter on top of it. 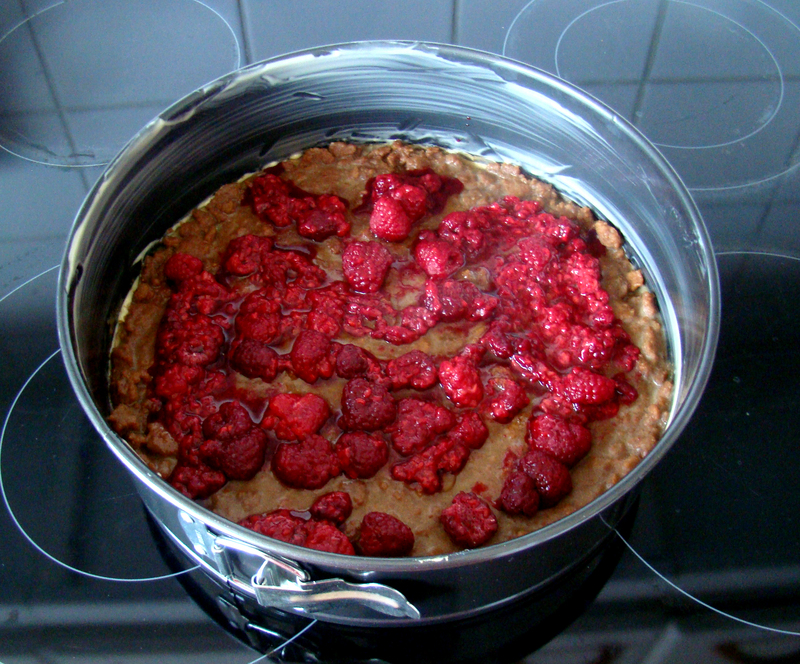 Decorate with the fresh raspberries and leave it to chill in the fridge for about 2 hours. That means we only get one day to recover from our MAJOR hangover! Perhaps because Fiesta Friday is all about enjoying and sharing and that should be happening every single day! Because it wouldn’t be a party if it happened every day, right? If you have any idea or thoughts on this question, please share it with me! I’d love to hear your opinion! Don’t forget to take a glass of bubbles! Sarah, what a beautiful and delicious cheesecake. thank you for the follow and so happy to have found your blog. I have such a hard time with cheesecake cracking when they bake, seeing your no bake cheesecake is exciting not only is it perfect for hot summer kitchens but it’s also super easy to make and no cracks will be seen. This cheesecake sounds superb! yum! 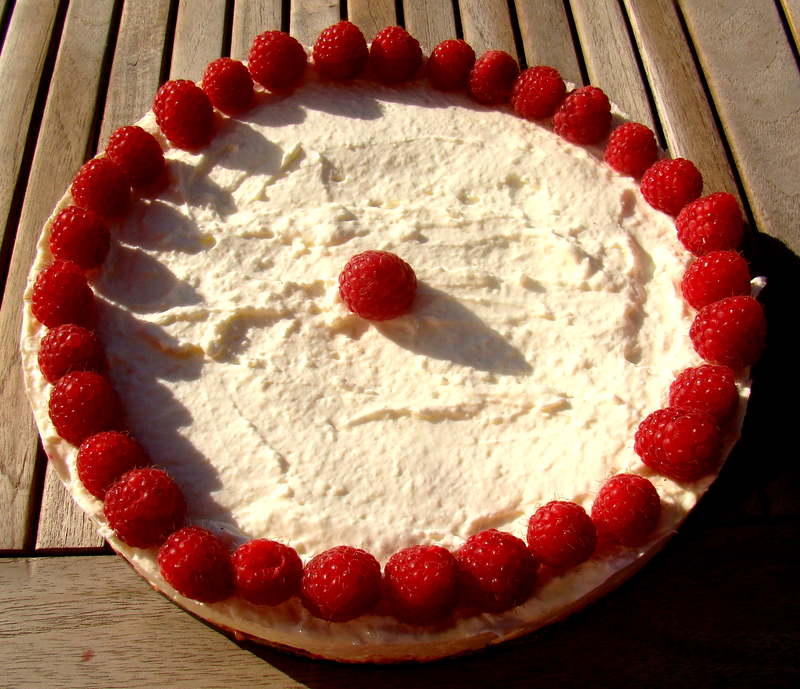 i had a cheese cake with raspberries and pears for dessert yesterday. This one of your exceeds expectations. Thanks for sharing! With pears sounds great too! What a gorgeous cheesecake Sarah! Love the idea of putting the raspberries on the crust! Looks delicious, creamy and fruity, love no-bake recipes for this time of year, thanks for sharing! Cheesecake is always the perfect dessert. This looks so pretty! I would easily help you eat the whole thing 😉 Happy weekend! 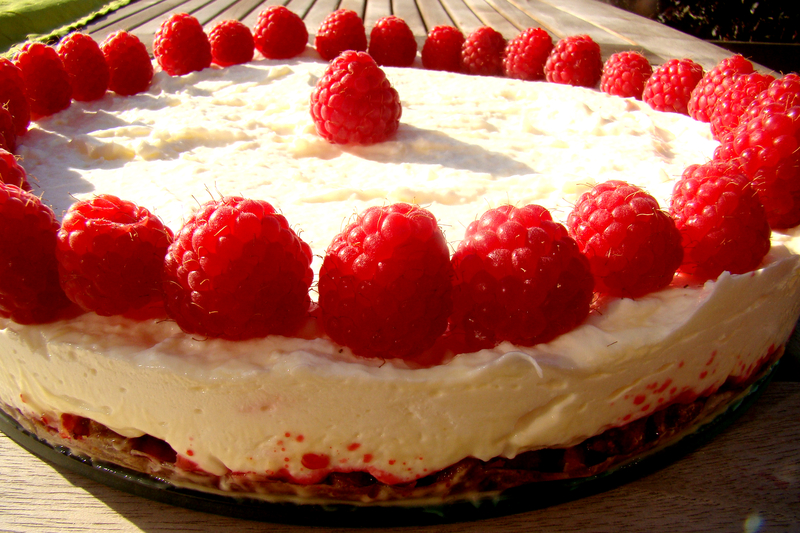 I love raspberry cheesecake- this looks amazing! biscoff? huh? I love rasberries too… your cake looks great! never thought of them in that way… just as a thing you got on the side of your cup! Haha 😀 me and my mom can eat lots of those cookies :p Jhuls used the spread for her Blondies, I’m definitely going to try that! Wow, what an amazing looking dessert. I love the hidden raspberries under the filling. I bet the raspberries really complement the filling, too. I wish raspberries grew throughout the year. Oh well, at least they’re available for a fair amount of time, and are available frozen. Happy FF! Yes they go great with this cheesecake 🙂 I wish so too! But there are indeed also frozen ones available 🙂 Thank god 😀 Happy FF too! 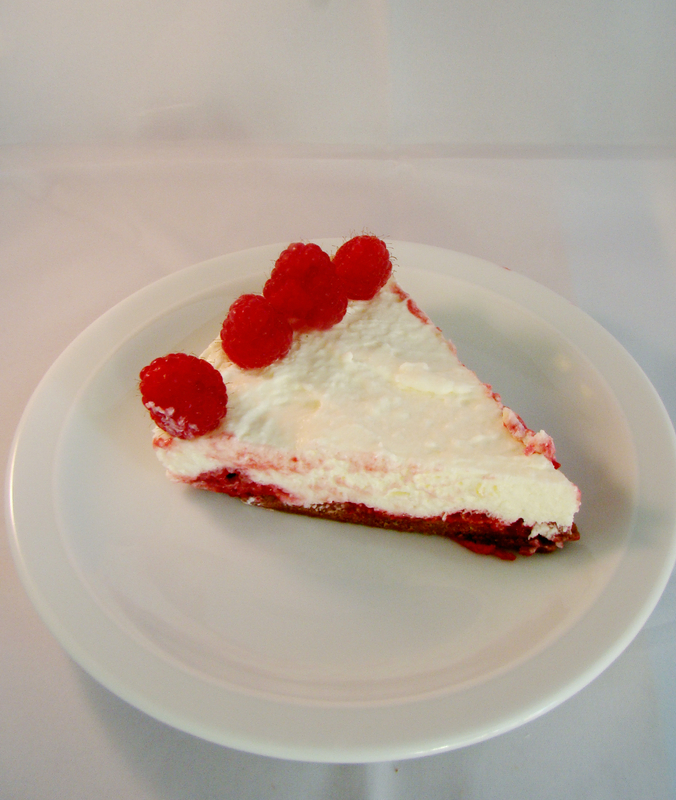 I love the addition of raspberries between the crust and the cream…. what a smart idea! Thanks to bring your cake to FF, cakes over there are really appreciated! OOOOOOOO….and I just bought a block of cream cheese tooo….guess I know what i’m making next! Thanks for bringing these to the party Sarah! Looks amazing, Sarah! How cool to put the fruit on the bottom! yum! Looking good Sarah! I like the idea very much of putting the fruit on the crust — smart! I haven’t forgotten about the Banoffee (did I get the name right from memory?) treat ! I'll try it this month, I promise! Oh good . . . on my way to eat frites but not Belgian ones unfortunately!!! Looks delicious! I am going to give your recipe a try, I love cheesecake!! woowww!!!! yum yum… i loved it!! !thank you for bringing it to the party.. Thank you! 😀 Happy FF back! I loved hearing the story behind this cheesecake Sarah! So fun! Wow, it sure looks fantastic! And even your non cheesecake loving brother liked it! Very impressive!